Author of the popular Primal Body, Primal Mind and widely recognized Paleo expert and nutritionist, Nora Gedgaudas presents a revolutionary, scientific, accessible high-fat diet for maintaining health, losing weight, and reversing some chronic diseases. Popular nutritionist Nora Gedgaudas returns with advice that may sound counterintuitive: Eat fat to burn fat. In her new book, Primal Fat Burner, she explains the benefits and science behind a ketogenic (or fat-burning) diet, which switches your metabolism from a dependence on sugar to running on healthy fats. As Gedgaudas reveals, numerous studies in recent years refute the long-promoted anti-saturated fat and anti-cholesterol agenda. Now, Gedgaudas explains the science that fat isn't a “no-no” but rather a “yes-yes”—if you know the right kinds of fats to eat. In her accessible, enjoyable style, she also lays out a practical meal plan with recipes. When you follow a ketogenic diet, you consume fewer calories overall! Author of the bestselling Grain Brain, Dr. David Perlmutter writes in his foreword that Primal Fat Burner is, “Wonderfully actionable, compassionately taking the reader from ‘why’ to ‘how.’” On this diet, you efficiently and effectively metabolize fat (ketones and free fatty acids) as your primary source of fuel, rather than glucose from carbs, starches, and sugars. Because fat is so satisfying, you naturally wind up eating less—without feelings of hunger or deprivation. And natural dietary fat is ultimately key to optimum health and longevity. Gedgaudas communicates a real appreciation for and understanding of the central role that dietary fat plays in your body and brain, and explains how you can eat to feel better, look better, think clearer, and live longer. Nora Gedgaudas is a board-certified nutritional consultant and a board-certified clinical neurofeedback specialist with over twenty years of clinical experience. An internationally recognized authority on ketogenic, ancestrally based nutrition, she is a popular speaker and educator and the author of the bestselling book, Primal Body, Primal Mind, as well as Rethinking Fatigue. 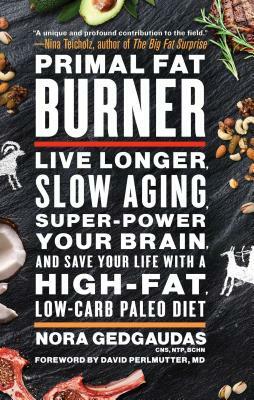 Her newest book, Primal Fat Burner: Live Longer, Slow Aging, Super-Power Your Brain, and Save Your Life With A High Fat, Low-Carb Paleo Diet has been lauded by bestselling author and journalist Nina Teicholz as “a unique and profound contribution to the field.” Her new weekly educational program Primal Power 52 is a unique and invaluable source of information benefitting those interested in true self-empowerment, furthering their nutritional knowledge and optimizing their health. Learn more at Facebook.com/PrimalNora and on Twitter: @NoraGedgaudas. "This book tells the fascinating story of how our very humanity--our healthy bodies and exceptional brains--evolved from eating animal foods including their natural fats. The science supporting the lack of harm--and indeed the benefit--of dietary fat, including saturated fat, has grown by leaps and bounds in recent years. In this well-researched and wide-ranging book, Gedgaudas shows a mastery of that science--and then takes it a step further. Drawing upon her many years of personal, clinical experience with patients, she explains how to take these principles into practice, bridging the gap between science and usable information for daily nutrition. This is a unique and profound contribution to the field." — Nina Teicholz, author of The Big Fat Surprise. "Ready to live long, lustily, wisely and well? Then it's time to let Nora Gedgaudas teach you the "fats of life."" "With able, funny writing; dozens of recipes; digressive but interesting boxed sections within chapters; and a note to readers to seek ultimate advice from their doctors, Gedgaudas lays out a plan for adopting a ketogenic diet for improved health and wellness." "Nora Gedgaudas makes the unique case for the central role of fat and outlines a way of eating to dramatically improve health. Ketogenic eating plans are an important tool to address the growing epidemic of autoimmune disease." “This [adopting a fat-based, ketogenic diet] is the single most important health intervention we can make as doctors... And as nations." “Nora Gedgaudas presents compelling information on the health benefits of dietary fat from an evolutionary perspective. She does an excellent job in debunking the myth that high-fat, low-carbohydrate diets are unhealthy, and that low-fat high carbohydrate diets are healthy. She provides valuable resources for those interested in transitioning from unhealthy high-carbohydrate diets to healthy fat-based diets." "Gedgaudas deftly describes the link between what we eat and what we become. Millions of years of human evolution made us omnivores with well-muscled bodies and extraordinary minds that could not have developed without a diet rich in fat, including saturated fat! Read this book and you’ll understand why much maligned animal fat is so important to your health and why it is critical that it come from animals grazing on healthy land (and not confined to feedlots). I cannot recommend this book highly enough." "This unique book provides a much-needed big picture, addresses the state of humankind, the errant direction we have all taken, the dark influence of global corporations and, most importantly, how we can regain our power and embrace a truly healthy, sustainable future. Nora makes the case to focus on what we all share: a common biological design, and a need for a food economy that restores local, natural systems. In this way, we can take back what was once ours, and what is fundamentally our primal birthright." "In terms of nutritional knowledge, Gedgaudas is about a decade ahead of 99% of U.S. physicians, who are taught virtually zilch about healthful eating in medical school. Counterintuitive though it sounds, increasing your fat intake will promote weight loss. The real nutritional villain is sugar (a fact kept hidden from us by the sugar industry!). The low carb-high fat diet in Primal Fat Burner actually protects people from obesity and heart disease. When it comes to making the overweight and chronically ill American healthy again, Primal Fat Burner is destined to be a real game changer." "Primal Fat Burner is an amazing follow up to Primal Body Primal Mind. Nora does what most writers won't do which is to truly answer the questions of those that want to know the answers. This book is full of incredible recipes, nutritional nuggets and an approach to Ketogenic dieting that will dispel the notion that Fat is bad. Get ready to clear your pantry of poison and find your paleo path in Primal Fat Burner today!"